When the 114th Congress convenes today, 104 women (76D, 28R) will serve among the 535 members, representing 19.4% of the new Congress. Four more women will serve as non-voting delegates to the House from American Samoa, Guam, the Virgin Islands, and Washington, D.C. Twenty women (14D, 6R) will serve in the Senate (20%) and 84 women (62D, 22R) will serve in the House (19.3%). At the close of the 113th Congress, one hundred women (77D, 23R) held office, including 20 women (16D, 4R) in the Senate and 80 women (61D, 19R) in the House. Before Representative Alma Adams’ (NC-12) victory in November’s special election, 99 women (76D, 23R) served in the 113th Congress. The net increase in women’s representation is five, or 0.9%, since the fall election. 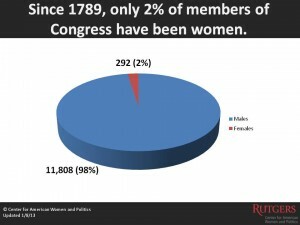 Just under one-third of women members in the 114th Congress are women of color. A record 32 women of color (29D, 3R) will serve in the House, making up 38% of women in that chamber. In the Senate, however, Mazie Hirono (D-HI) remains the only woman of color among 20 female members (5%). Thirty women of color (28D, 2R) served in the 113th Congress before November, increasing by one (31: 29D, 2R) with Adams’ special election. Among all women who will serve, 14 women are newly elected to their chambers. Two women (2R) are newcomers to the U.S. Senate: former Representative Shelley Moore Capito (R-WV) and Joni Ernst (R-IA). Twelve women (7D, 5R) are newcomers to the U.S. House: Martha McSally (R-AZ); Norma Torres (D-CA); Mimi Walters (R-CA); Gwen Graham (D-FL); Debbie Dingell (D-MI); Brenda Lawrence (D-MI); Alma Adams (D-NC); Bonnie Watson Coleman (D-NJ); Kathleen Rice (D-NY); Elise Stefanik (R-NY); Mia Love (R-UT); Barbara Comstock (R-VA). The new delegate is Stacey Plaskett (D-VI). Nearly half of the new members of the House, 5 of 12 (41.7%), are women of color: Adams, Lawrence, Love, Torres, and Watson Coleman. Delegate Stacey Plaskett (D-VI) is also among the new Black women in Congress. Utah’s Love is the first Black Republican woman to serve in Congress. Elise Stefanik (R-NY), age 30, is the youngest woman to serve in Congress, taking over that title from former Rep. Elizabeth Holtzman, who was 31 when she took office in 1973. States Four states – IA, NJ, UT, and VA – will go from no women representing them in the 113th Congress to one woman in their congressional delegations in 2015. Senator Joni Ernst (R-IA) is the first woman ever to serve in Congress from Iowa. Representatives Bonnie Watson Coleman (D-NJ) and Mia Love (R-UT) are the first Black women to represent their states in Congress. Representative Barbara Comstock (R-VA) is the first woman to serve in Virginia’s congressional delegation in two decades. Two states – PA and LA – will go from having one woman representing them in the 113th Congress to no women in their congressional delegations in 2015. They will join 11 other states that continue to have all-male delegations in Washington: AR, DE, GA, ID, KY, MS, MT, OK, RI, SC, and VT. Among these states, MS and VT have never had women in their congressional delegations; the others have had women in the past. Parties As the Republicans take over both chambers of Congress, women represent 9.3% of all majority members (38 of 301). Women are 11.1% of all Republicans in the Senate (6 of 54) and just 8.9% of all Republicans in the House (22 of 247) in 2015. Despite Republican gains overall in the 2014 elections, Republican women remain a small percentage of their congressional caucuses. In the 113th Congress, Republican women were 8.2% of all Republican members, including 8.9% of Republican Senators and 8.1% of Republican Representatives. Democratic women, on the other hand, represent one-third of all Democratic members of Congress in 2015 (76 of 234). 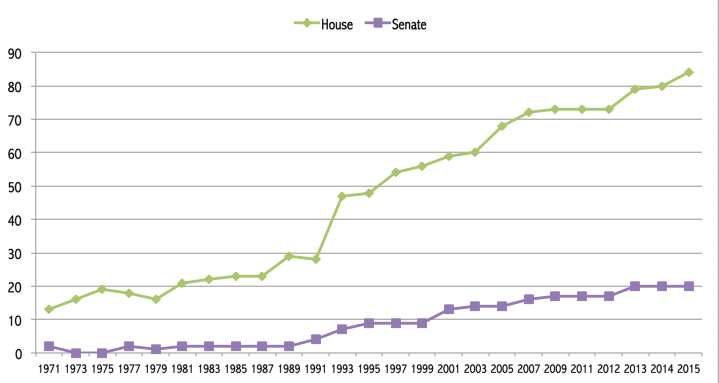 Women are 30.4% of all Democrats in the Senate (14 of 46) and 33% of all Democrats in the House (62 of 188). In the 113th Congress, Democratic women were 30.3% of all Democratic members, including 30.2% of Democratic Senators and 30.3% of Democratic Representatives. Adams will serve in her first full term in the 114th Congress, also serving two months at the conclusion of the 113th Congress. The following blog is a guest post from Felise Ortiz, a senior at Rutgers University-New Brunswick, double majoring in Political Science and Women's and Gender Studies with a minor in Spanish. She is an alumna of the NEW Leadership NJ Class of 2011. Felise is the Founder and President of Douglass D.I.V.A.S., a female empowerment student organization at Rutgers University. She is also an Institute for Women's Leadership Scholar as well as an Eagleton Institute of Politics Undergraduate Associate. The underrepresentation of women in politics in the United States is an issue that needs to be addressed immediately and with urgency. With the help of the Institute of Women’s Leadership, my partner Jennifer Osolinski and I were able to facilitate a conversation addressing this issue. Our social action project was not only an opportunity to hone our feminist leadership skills but it also served as testament to the fact that the personal is indeed political. As former Eagleton and CAWP interns, Jennifer and I wanted our event to make at least one young woman consider a first step in the direction of politics. We were inspired by programs such as NEW LeadershipTM and Ready to RunTM because they inform women about the current political climate and encourage them to become involved in public service. 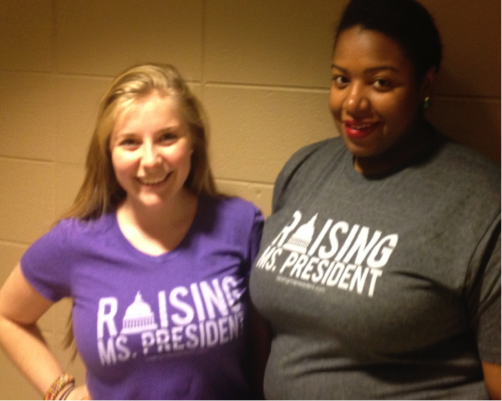 While strategizing on how to reach a youthful audience, we were approached with the possibility of doing a film “Raising Ms. President” a new documentary about getting girls politically active. Once we watched the trailer, we agreed that it would be a great foundation for our project and our overall message. I learned a lesson in patience and professionalism from this portion of the experience. I also learned that is apart of the feminist model of leadership to use your network. Our networks ultimately resulted in three amazing panelists and the film arriving on time. We had an audience of about twenty-five people who were enthusiastic about the film and project as a whole. 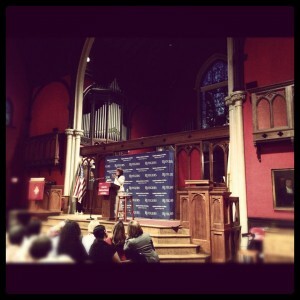 I had a list of prepared remarks and questions for the panelist. However, I learned the most from the audience’s engagement with the panelists. There were many though-provoking questions asked and answered. The key moment of the event for me occurred after most of the attendees departed and two panelists were left talking passionately about campaigns. One woman was a Caucasian Republican representative from a suburban town and the other was a Black Democrat from an urban city, and they were networking. I watched politics (how it should work) happen organically with two women who shared a love for public service. This project has taught me three key lessons: 1. The message is worth the madness. We were able to spread our message that women’s political involvement is important and can be transformational when it is made a priority. Any of the difficultly that we may have faced along the way was well worth it. 2. Not only is the personal, political but also the political is often better executed when it is personal. The research and our panelists attested to the fact that there is a dire need for more women in office in order for issues that affect women to be adequately advocated for. Another example would be my personal connection to this project, made me invested enough to see it through to the end. 3. Social justice based women’s leadership has been and will continue to be a force to be reckoned with. During this process I have been inspired by the social action projects of my classmates and how we have rallied together to support one another. The bond we created through this experience has strengthened me and I am truly grateful to have had this opportunity. Last night, I joined an expert group of women on HuffPost Live to talk about Warren Buffett’s Fortune article on the importance of women’s full inclusion into American business, politics, and leadership. Put simply, Buffett argues that women are essential to American growth and success, representing half of the population that has been underutilized (“relegated to the sidelines”) for too long. Stifling half of the country’s talent is not only unethical, he writes, but is also bad business. And, as we know at the Center for American Women and Politics, under-representation of women in political offices is bad for democracy and governance. Our research shows that women bring unique voices to government, as voters, advocates, and elected officials. When in office, women prioritize different issues, build upon unique experiences, and often take a more inclusive and collaborative approach to governing. In the current political environment, it’s women who have provided at least some hope of breaking the paralysis that has characterized our nation’s capital. And, with women still representing less than 20% of Congress and under a quarter of state legislative posts, we have significant “human capacity,” in Buffett’s terms, left to be tapped. How do we capitalize on women’s capacity to lead? Buffett calls on his male colleagues to “get on board” with gender parity, but also urges women not to doubt their abilities nor give in to structural or self-imposed barriers to advancement. There is a symbiotic relationship between structural barriers and self-doubt, however, where women’s experiences with (or within) male-dominated institutions make it hard for them to view themselves as equal players in what remains a man’s world. The change that fuels Buffett’s optimism for the future is reliant on disrupting masculine dominance in public life, and that means altering long-held images of and expectations for public leadership. Buffett describes how, as a young man in the 1940s and 1950s, his floor for professional success was the ceiling for his sisters. In other words, society’s expectations for boys were not only greater than those expectations for girls, but women faced structural barriers that halted their path to leadership before they could even dare to see themselves as heads of communities, companies, or countries. Buffett is right to note that those structural barriers are eroding, but societal expectations of how leaders look and act still fall heavily into a male mold. CAWP has recently launched Teach a Girl to Lead, a campaign meant to change those expectations among boys and girls so that the idea of women’s leadership is not extraordinary, but ordinary – and essential. If we are to be as optimistic as Warren Buffett is about America’s future, we know that it’s imperative that future generations of girls and women not only see themselves as public leaders, but help to shatter the glass ceilings that remain in politics and government. That’s not only good for democracy, but it's also best for our country’s bottom line. On April 16, the Center for American Women and Politics welcomed Melody Barnes - former assistant to President Obama and director of the White House Domestic Policy Council – as this year’s Senator Wynona Lipman Chair in Women’s Political Leadership. Barnes spoke on Policies that Empower: The Journey from Vulnerability to Engagement, detailing the policy agenda that she deems essential to moving our country forward – particularly among the most vulnerable and most growing populations of Americans. In addition, Barnes paid tribute to the Chair’s namesake – Senator Wynona Lipman – by detailing both her accomplishments and her legacy. While Senator Wynona Lipman became the first African American woman elected to the New Jersey State Senate in 1971, her legacy is not simply as a “first;” she is best remembered as an advocate, activist, and champion for those whose voices could easily be left unheard in the halls of power. In her remarks, Barnes referred to a quote from Senator Lipman that shaped the remainder of her speech. Senator Lipman frequently told young people, “If you want to create change, don’t just get to know important people, become important people.” This message resonates amidst recent discussions about “leaning in” not only to make a difference in your own life, but also to affect the lives of others. Women in politics have begun to heed this message. Women play an essential role in electing our political leaders; they vote at higher rates and in higher numbers than their male counterparts, and women’s votes have decided the outcomes of recent elections. While this could be viewed as women supporting other important people, women voters have proven that they, in fact, are some of the most important people in electoral politics today. But women’s political participation should not stop at casting ballots. To take Senator Lipman’s words truly to heart, women should fight for their rightful places at decision-making tables throughout our nation, whether on councils, boards, or in our state and federal legislatures. Senator Lipman knew that advocacy and activism are essential to make change, but being in positions of power to heed the calls of advocates in creating policies or statutes is essential. And, as Barnes noted, Senator Lipman emphasized follow-up to ensure that once on the books, laws were enforced effectively. Melody Barnes shared her journey to becoming an important person who was able to sit at some of the highest decision-making tables in the land – advising President Obama and shaping his domestic policy agenda. She has followed Senator Lipman’s advice and has made tangible change – from helping to craft and pass the Affordable Care Act to enacting education reforms from early childhood to higher education. But what Barnes reiterated in her remarks were the ways in which we all are, or can become, important people by harnessing the power we already hold (and of which we are often unaware) to make change in the areas we choose. Politics is an opportune site for harnessing that power, and it’s one where women must engage to create the lasting change they seek. A new report from political scientists Jennifer Lawless and Richard Fox finds a gender gap in political ambition among young people, ages 18-25. More specifically, Lawless and Fox report that multiple factors in men and women’s socialization – parental encouragement, political exposure/engagement, participation in sports, and perceptions of personal qualifications – make it more likely that young men see a political future for themselves than do young women, particularly in elected office. Simplifying their argument in the report’s title, Lawless and Fox write that “girls just wanna not run.” But beyond the catchy title, the findings presented in their report are more nuanced and more important. The report suggests that young women see alternative avenues to making political and policy change, and running for office is not a path on which they can envision themselves. Girls want to change the world, but they have yet to see running for electoral office as the means to that end. Lawless and Fox find that young men and women share equitable rates of activism. However, while young men’s activism may more often lead to a political campaign, their findings show that women view charity work (over running for office) as the best route toward social change. Though the authors cite this as evidence that young women are less politically ambitious than young men, it may better demonstrate that women’s ambition simply differs from men’s in both what they seek to accomplish, and how. The fact that young women expect to make a difference from outside of formal government is not terribly surprising in light of both the current paralysis in Congress and state legislatures and women’s historical exclusion from formal institutions of governance. Forced to take another path toward social change, women have fought countless battles toward equality and justice from outside of our legislative halls – and won. And, if women feel under attack by those who are making laws, it is hard for them to envision seeking positions alongside them. It’s also hard to knowingly seek entry into institutions where you are so obviously apart from the norm. Women make up less than one quarter of the nation’s legislators – whether at the state or congressional level, only five states have female governors, and no woman has ever sat in the oval office. The absence of women in both men and women’s perceptions of public leaders is further exacerbated by the dearth of women leaders highlighted in history books, portrayed on television or in film, and/or introduced to young people far before and throughout adolescence. Simply put, women are less likely to see themselves in the public leaders to which they are most exposed well before hitting age 18. And, as Marian Wright Edelman rightly states, “You can’t be what you can’t see.” In order to encourage women to see public leadership, and specifically elected office, as an effective means toward making the social change they seek, we must provide them with more inclusive images of political leaders. Lawless and Fox prescribe this in their report, calling on organizations on college campuses to “[expose] young women to female candidates and elected officials and [provide] examples of how pursuing electoral office can bring about social change.” We are proud to do this work through CAWP’s NEW LeadershipTM program, a leadership training program that demystifies politics for college women and connects them with female political leaders and mentors. However, this exposure – and challenge to masculine images of public leadership - must also begin much earlier. Our most recent initiative, Teach a Girl to LeadTM, will take on this challenge directly by providing the tools and resources to parents, teachers, and educators to integrate women leaders into the lessons they teach, stories they share, and images they provide to children at all ages. Introducing young people to political information at any age may catalyze political engagement and ambition as they grow up, but exposure is ineffective in encouraging women’s political involvement if that information only reinforces the message that politics and government is a “man’s world.” Instead, providing both girls and boys with more inclusive images of public leadership from an early age has the potential to alter – and expand - their ideas of both who can lead and how public leadership can be an effective path toward social change. This re-vision will go a long way to ensuring that when girls think about how they want to change the world, they see elective office as a way to do it.